On this page you will find pictures of the various pieces that Hans Holbein designed for Anne Boleyn. 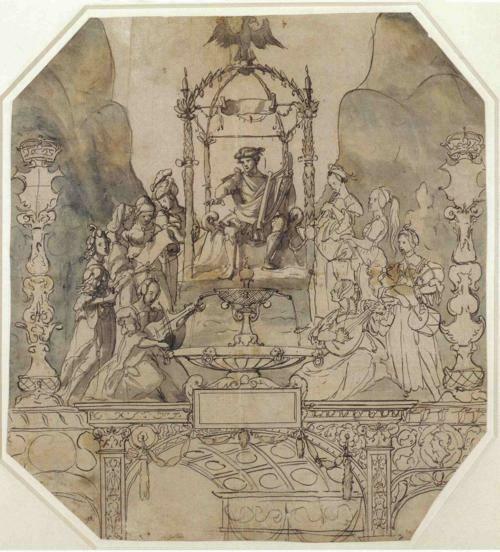 Hans Holbein was commissioned by Anne Boleyn to design displays for her coronation processions on the 31st May and 1st June 1533. One tableau was erected in Gracechurch Street and was a representation of Apollo and the Muses on Mount Parnassus. This cup was designed by Hans Holbein for Anne Boleyn and it featured four satyrs, a crown cover and Anne’s device, a falcon, standing on roses. 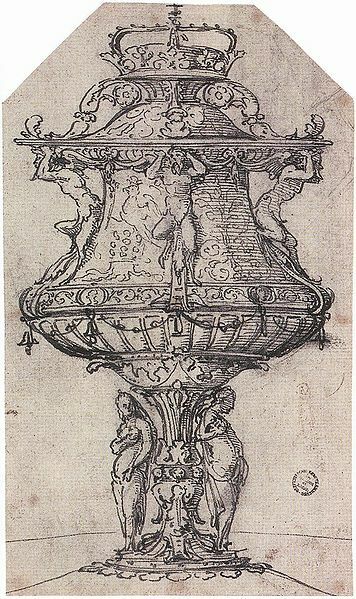 This cup has often been mixed up with the table fountain that Anne gave Henry VIII in January 1534 but Eric Ives points out that the drawing of the Basle cup is not that of a water device and the descriptions of the table fountain do not make any mention of the crown cover or the four satyrs. This famous Renaissance painting was painted in Spring 1533 by Hans Holbein and Eric Ives wonders if it was actually commissioned by Holbein’s patron at this time, Anne Boleyn. The pillar dial on the painting gives a date of the 11th April 1533, the very date that Henry VIII’s court was informed that Anne Boleyn was queen, so Anne may well have had something to do with this work of art. The Holbein Sketch – Is it Anne Boleyn? Hi Claire, do we have any primary sources that tell us about the relationship between Anne and Hans Holbein? Were they friends, would he dine with her and Henry etc. or do we have any snippets of conversations that passed between them? I have never seen any, but wondering if you might know of something…. I’ve never found a primary source about them meeting or dining, I’m afraid – wouldn’t it have been lovely to have been a fly on the wall – but we do know that she commissioned work from him and that must have involved meetings to discuss it. Claire, I am fascinated by your posts on Anne Boleyn. I am searching for a portrait of her by Holbein, but see references to “Unknown artist” instead. Perhaps all her images were destroyed after her execution by order of Henry? 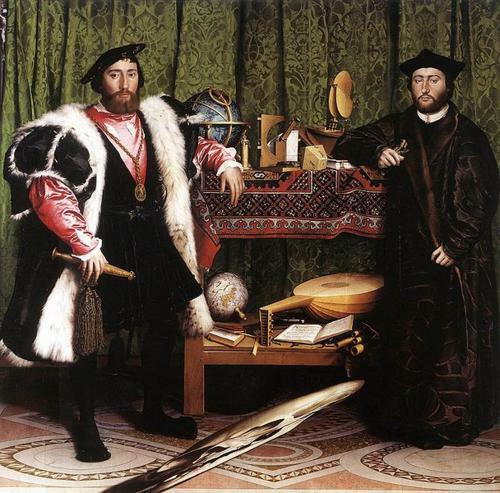 I write a color blog and Hans Holbein is my first Art History 101 subject. The post will be published in May 2014, so I have time to do more research. I have found portraits by Holbein of Thomas More and Henry, et al. Any information you may have on Anne’s true likeness would be appreciated. The sketches by Holbein are the closest I have found so far and may have to suffice. There is no surviving contemporary portrait of Anne Boleyn, which is very frustrating, the only contemporary image of her is the medal which has some damage to the nose. There are two sketches by Holbein which have been labelled as being Anne but nobody knows if they actually are. See https://www.theanneboleynfiles.com/anne-boleyn-portraits-which-is-the-true-face-of-anne-boleyn/ for a discussion of some of the images of Anne. I hope that helps! I am so fascinated by all things “Tudor”.. This site is so full of interesting info, I read it daily & love every minute! Thank-u so much for posting these wonderful articles & portraits. I am an American but my dream is to someday stand inside Hampton Court & just “feel” the history all around me! Since my trip to England might never happen….this site fulfills my “Tudor” fix daily! Thank-u so so much! Given the close working relationship between AB and Hans Holbein I assume that there must have been at least one major portrait, possibly full-length. Since nothing is extant such portraits are likely to have been destroyed. However, they were valuable intrinsically. Is there any evidence that such a portrait might have been overpainted, possibly even leaving the remainder of the picture untouched? Or are we just to assume that Henry had a bonfire? Her interesting portrait studies that always have been. Preserved life history from centuries ago. Elizabeth I changed history as a female sovereign strong and bold! So sad her life was too short too premature. I’m wondering if further forensic research is being done on the “hidden portrait” discovered underneath the famous serpent painting of QEI? Could modern technology help us to more clearly see the image of what may possibly be Anne Boleyn, lying safely beneath the image of her daughter, Queen Elizabeth I? It brings to mind the ring Elizabeth wore till her death, carrying within its hidden compartment her own portrait, facing that of her mother, Anne.